As we write this watchdog report on July 20, Robert Mueller and his team seem too close to truth for (so-called) President Trump’s comfort. The Resistance now must contemplate: What if Trump fires Mueller? Who is Robert Mueller? Robert Mueller currently serves the US Justice Department as special counsel for the investigation of Russian interference in the 2016 presidential election and related matters. He took over for Senator Sessions, who stepped away from the case because of his own less-than-transparent relationship with Russia. In an odd legal setup, the President has the authority to fire Mueller and other special counsel. It would make Trump look darn guilty… but presidents have been firing investigators since the 1870s. Donald J. Trump is now searching for justifications to fire Mueller. In Trump’s view, the “justifications” need only please his base. Watchdogs point out that Trump’s finances and the Russia investigation are inseparable. For those unfamiliar with this area of thought, we refer you to The Dworkin Report as a useful introduction. Mueller has not been dissuaded, as reported by ABC News. The “three percent” idea is taken from the 3.5% rule of civil disobedience. 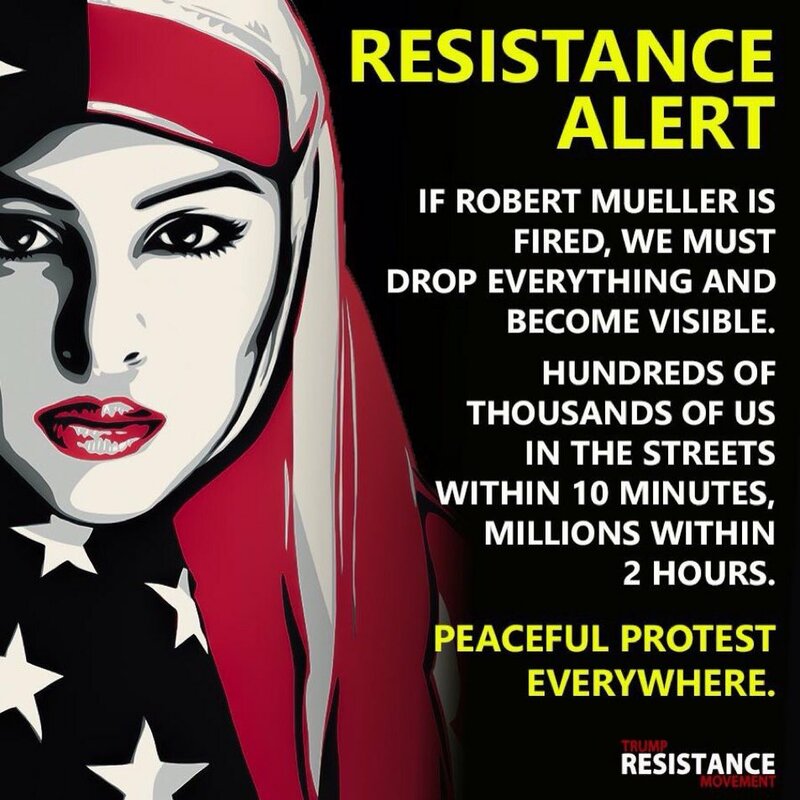 If it’s true that a protest of 3.5% of the population can topple a dictatorial leader, then the US needs a turnout of about 11.5 million if Trump fires Mueller. Clearly, firing Mueller would not further Trump’s argument of no personal wrongdoing. Keith Olbermann makes this point in the following video. But we imagine that Trump likes the idea of buying time. (He might even manufacture another crisis as diversion.) Also, as Olbermann points out, “looking guilty” hasn’t always dissuaded presidents in the past. We note a couple of examples below. America’s very first federal special prosecutor, John B. Henderson, was appointed by President Ulysses S. Grant to investigate the Whiskey Ring scandal in 1875. But when the investigation turned to Grant’s own secretary, he fired Henderson for what we’d call a Trumped-up reason. Almost a hundred years later, President Richard M. Nixon fired special counsel Archibald Cox, who was investigating the Watergate scandal. Nixon actually tried to abolish the position entirely, but public outcry reversed his course. Get ready to act! You can find local Trump Resistance groups at IndivisibleGuide.com. As a card-carrying liberal, I’m writing about the image of the woman wearing the American flag as a religious cloth. It’s a ubiquitous image now. I have no quarrel with any religion. However, I do guard our Constitutional mandate (not a right, a MANDATE) to maintain a separation of church and state. Wearing the flag as a religious garment is a clear violation of that mandate. It is an unnecessary element in the artwork. Hmm, not sure which card you claim to have. An actual “liberal” would show more concern for the active destruction of democracy. A woman showing her pride in America with a possibly dubious fashion choice is not polluting your air, nor reallocating your tax dollars to the uberwealthy, nor grabbing anyone’s body without consent. You want to know who has more power than President Trump? They can arrest you anytime and anywhere without you committing a crime, they are corrupt!